It seems that Porter Air has been running some version of this sale for nearly a year now – some percentage off if you book in the next few days for travel in the upcoming quarter. The dates and percentages change but this is the first time I’ve seen the discount rise to 50% off and the first time I’ve seen it stretch out 4 months for travel. Hard to complain at all about either of those things. 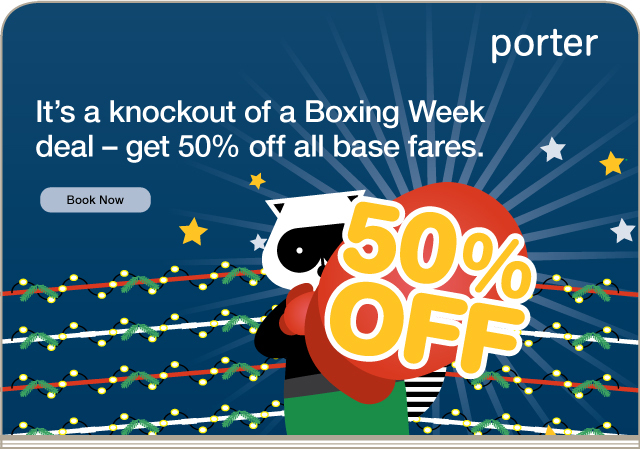 Book at FlyPorter.com and use promo code BOX50 to get half off for travel between now and April 30, 2012. Book by January 6, 2012. Oh, and if you’ve never had the opportunity to experience Porter, give ’em a try. I’m a big fan, especially when heading to/from Toronto. Flying in or out of Toronto City Airport just off the heart of downtown is a great experience.